We know you have many choices when choosing a Podiatrist in Louisville, KY, so we have made requesting an appointment a simple process via our Web site. If, for any reason you cannot keep a scheduled appointment, or will be delayed, please call us as soon as possible..
We take pride in providing you with a comfortable office experience. 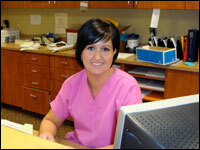 Our qualified staff is friendly and will ensure a pleasant visit. Our main office is conveniently located in Louisville, KY . We invite you to e-mail or call our office with any questions via the contact us or request an appointment page of our Web site.